Globecast provided SNG satellite services at EURO 2016 in France. Paris, July 2016: Globecast provided a range of contribution services for multiple broadcasters covering the UEFA Euro 2016 competition. Contested every four years, this year’s event – held in France - was the first time the tournament featured 24 teams from across Europe. Globecast provided a combination of SNG and contribution satellite services for an Italian broadcaster, managing all contribution between the IBC (International Broadcast Center) at Porte de Versailles and its dedicated outdoor studio near Paris’ iconic Eiffel tower. All contributions to and from the IBC were also being managed for a French and South African broadcaster. 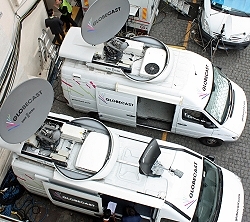 Globecast was also contracted to provide and operate a flyaway antenna on the rooftop of a Russian broadcaster’s outdoor studio and manage all contribution transmissions to Russia. To support its activities during Euro 2016, Globecast provided French, British, Italian and South African engineers – deployed locally in Paris at the individual broadcasters’ studios and/or at IBC – to deliver dedicated support to each customer during the month long competition taking place from 10 June-10 July 2016. In addition, Globecast provided live standup positions in Paris/St Denis (with a view of the Stade de France) and Marseilles (with a view of the city and stadium), throughout the competition to serve a number of international TV networks from China, Ukraine, Germany, Japan, South Africa, Malaysia and France.